I love science. For science is all these little parts but still it is much more than the sum of its parts. It has a million ways to excite you and surprise even the uncaring among us. And thus, often for indulging Little B in productive play, I use science. 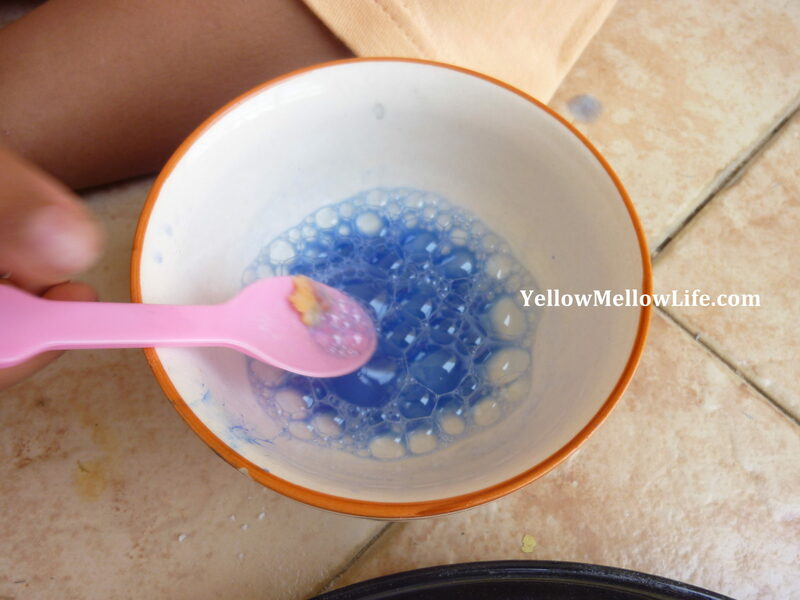 Like making slime or freezing and melting water or collecting fallen leaves. She doesn’t know the ‘science’ behind it but she does marvel at it anyhow. One such science that always pushes the curiosity among kids is the reaction between baking soda and vinegar. The science is simple – mixing them together generates carbon dioxide and hence generates fizzy bubbles. This one simple principle can be applied to dozens of fun activities for kids. 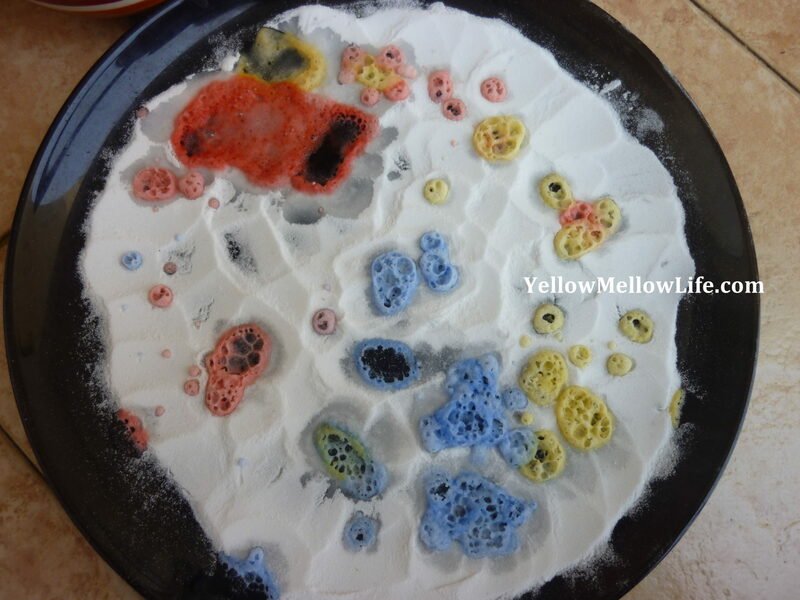 One such activity is that of baking soda and vinegar painting. 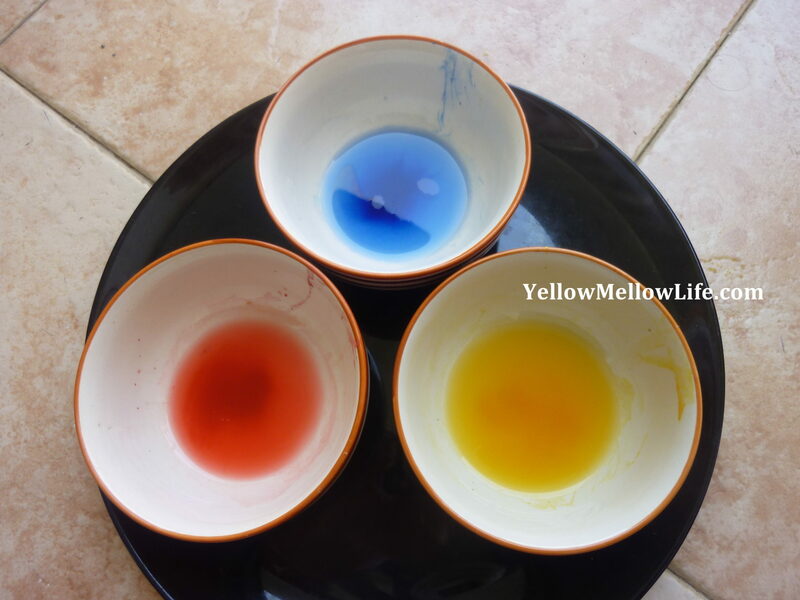 Take about 2-3 tbsp of vinegar in 3 different bowls. 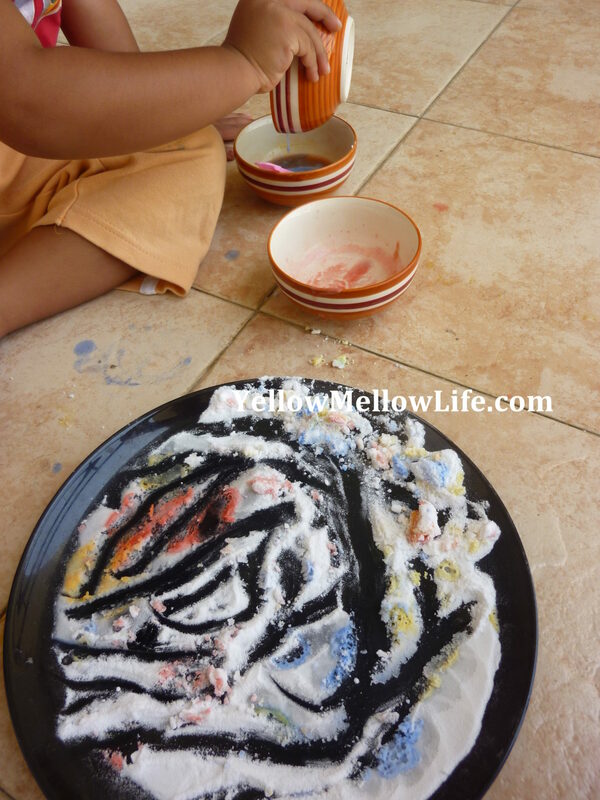 Add few drops of paint to these bowls. Spread the baking soda on your dinner plate (2 mm height should be ok). 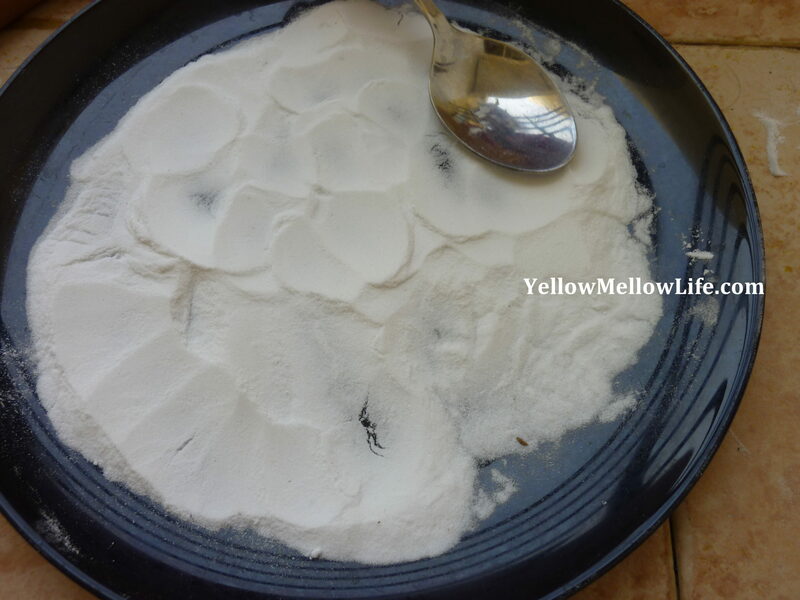 You can use a bigger plate and for that you would require more baking soda. Now using either a spoon, a straw, a dipper or a syringe, drop colored vinegar drops on your baking soda bed few drops at a time. Little B using spoon at first. Then switched to a syringe. After doing this for about 15 minutes, Little B started doing her own chemical experiments. 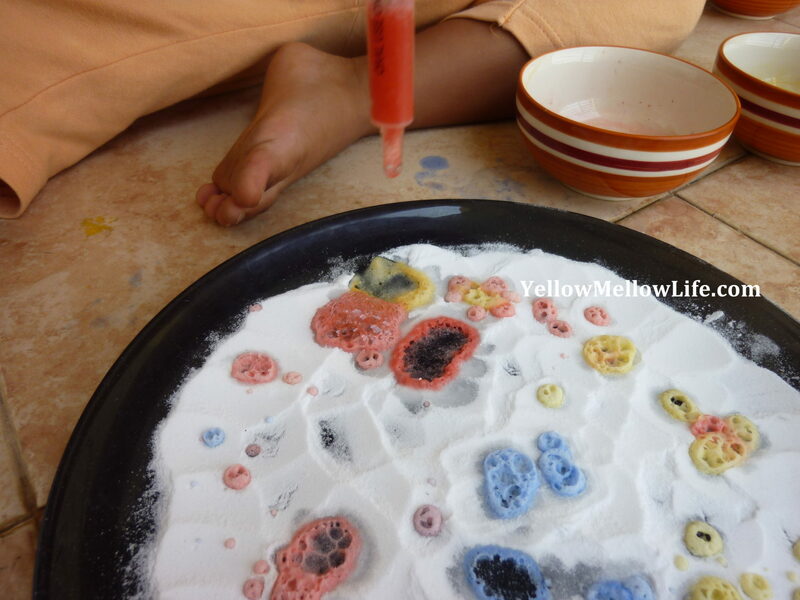 Instead of adding vinegar to baking soda bed she started adding baking soda to vinegar bowls. This too gave her the fuzzy bubbles and she felt elated on her discovery. Another 15 minutes and the project took a weird messy turn with everything getting mixed in everything else. Needless to say, this was the part that Little B enjoyed the most.